With this cold weather & a little bout with a cold, Thai curry soup has been my current obsession. To me it's sort of like chicken noodle soup on steroids. I've ordered it out a few times lately but decided it was time to make some at home. There are a lot of recipes for this soup online but I was inspired most by this one on Pink Bites, though I added some garlic & bumped up the amount of red curry paste. It's pretty darn close to the soup I've been having out though it needs to be just a touch spicier, not sure exactly what to add for that yet. One of my goals when making this soup was to be able to make the broth & refrigerate it, then just cook up a single serving as needed for lunch or dinner. It worked perfectly & by cooking just a bowl's worth as needed the vegetables remained crisp. I used broccoli florets, red onion, mushroom, carrot but you could use any mix of fresh vegetables you wanted. A note about the noodles. I used rice sticks because those were what I had on hand. What I really wanted for this soup was a thicker rice noodle, one that was almost the size of fettuccine but I couldn't find it at the store. The rice sticks worked well though & cook up quickly in 3 minutes which worked wonderfully for making up single servings of soup. Bring back up to a simmer. Add the onion, carrot, mushrooms & broccoli. Let cook for 2 minutes. Stir in the rice sticks. Cook for 2 more minutes. Add the spinach & cook for 1 more minute. That soup looks inviting. I've been wondering what else I could use that jar of red curry paste for and a soup base just never occured to me. Giving this a try sooner than later. I could use a bowl of this right now!! Looks delish! That does look wonderful and I'm always on the lookout for new soups. Thanks for the inspiration! Sounds great. This is a must-try for us. We love soup and anything with a bit of spice! You keep reminding me of things I haven't stocked the kitchen yet that I need to pick up - red curry paste. Soup sounds so great and I love Pink Bite's blog! I saw you tweeting or fbing about this - and I was wondering how it turned out! Looks wonderful and warming! OH this sounds so good and I've been craving curry lately too! Mmm that's what I always order out too! I'm going to vegetarianize this recipe and cross my fingers that it comes out as good as yours! Thanks for the recipe! THis is one of my favorite soups. I have to try your version next! You are so right - that is exactly what this weather is calling for! This curry looks so comforting and savory! I made this for lunch today and my family devoured it - start to finish, less than one hour. Everyone wanted seconds, but there wasn't any left. My advice? Double it. The hubs doesn't like thai, but I am a huge fan, looks great! I will make a pot for myself. I picked up some rice sticks at Trader Joe's that are Thai-style and shaped like a smaller fettucine noodle. I haven't tried them yet, but this recipe gives me the perfect, yummy excuse. Thanks! 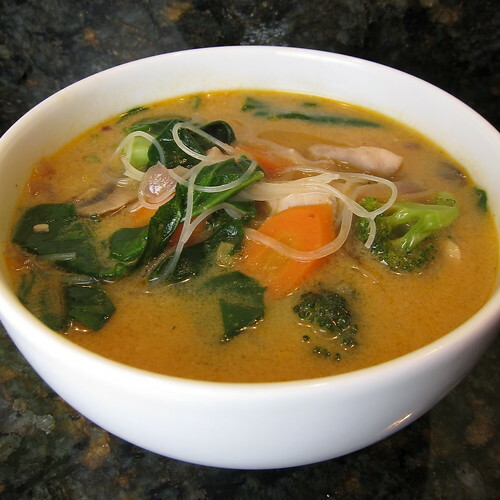 Oh, gosh -- I remember the first time I added a dollop of red curry paste to a bowl of chicken noodle soup hoping to clear out my sinuses... it was wonderful. And this looks like an even better (more well thought out) version. I can totally understand how this could become an obsession. There is a restaurant that makes an excellent Thai soup very close to where I work. I've been thinking of replicating it. This looks like a good starting point.